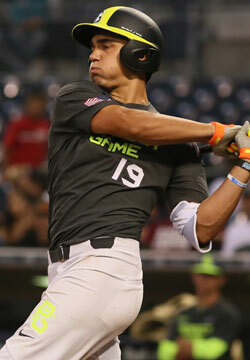 Williams is the only home-schooled player at the 2015 PG All-American Classic, although he does play high school baseball in the spring for a suburban Kansas City high school. He is also a recent addition to the 2016 class after re-classifying from the 2017 class this past spring. Williams is a dynamic athlete with 6.5 speed in the 60-yard dash, a big infield throwing arm and plenty of righthanded power at the plate. He's played less high level baseball than most of his peers but has the ability to catch up quickly given his baseball skills.